The canvas is the big white area in the center of OmniGraffle’s interface where you draw and create things. 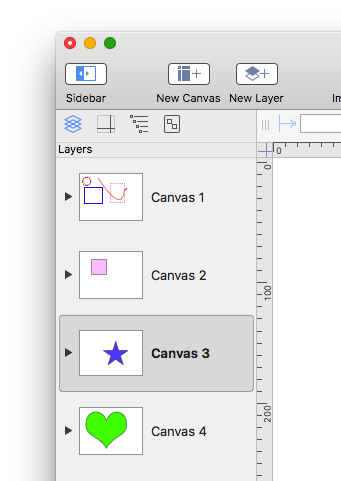 An OmniGraffle project (document) always contains at least one canvas and one layer. An OmniGraffle document can contain many canvases, of varying sizes and with a variety of properties and settings. For example, an OmniGraffle document may contain a canvas that is 1600 points by 1200 points, a canvas that is 768 points by 1024 points, a canvas that is 400 points by 400 points, and even a canvas that adjusts its size to fit the objects drawn upon it. Also, as an aide for precision, a canvas can display a grid that optionally may cause drawn or imported objects to snap to its lines. Canvases in OmniGraffle are totally flexible in their implementation and abilities. This section examines how to script canvases in OmniGraffle. DO THIS ► Install the Canvas Tools plug-in, a collection of actions for manipulating canvases in OmniGraffle. (TIP: see the Big Picture page for more details). 02 var targetName = "Tulip"
And because canvases are an element of the Portfolio, you use the addCanvas() method of the Portfolio class to create a new canvas. The result of that method is a reference to the newly created canvas, which can be stored in a variable to reference the canvas later in the script. In the example script above the value of the canvas’ size property is set by creating a new Size object using the desired canvas width and canvas height, in points. Scripts always use points when getting and setting the size of a canvas. The name property of a canvas can be read and changed. The following scrpt is an example of creating a new canvas whose name is, or an incrementation of, a specific name. More naming examples are on this page. 02 baseName = "My Canvas Name"
03 versName = "My Canvas Name"
Canvases can be reordered within the stack of canvases. To change the stack position of a canvas, use the orderBefore() and orderAfter() methods. These instance methods take a direct parameter that is an object reference to canvas that the moved canvas is placed before or after. In the following example, the current canvas is moved to the top of the stack of canvases. Note the conditional statement (line 3) that compares the value of the id property of the current canvas with the value of the id property of the top canvas, to ensure that the current canvas is not already the topmost canvas. And the example below uses the orderAfter() method to move the current canvas to the bottom of the stack of canvases. This script also performs a compariosn using the canvas id property (line 3) to ensure that the canvas to be moved is not already the bottom canvas. In this example script, the orderBefore() and the remove() methods from the Canvas class are used to essentially delete every canvas except the one that is the current canvas. This task is accomplished by first moving the current canvas to the top, and then deleting the remaining canvases starting at the bottom and iterating to the top. Note the conditional statement (line 3) that compares the value of the id property of the current canvas with the value of the id property of the top canvas, to ensure that the current canvas is not already the topmost canvas. The following instance methods of the Canvas class are covered in other sections of this website. Click|Tap on the method name to go the related page. addText(textString, graphicOrigin) (Solid) • Create a new shape containing text (with no stroke or shadow) and place it on the first visible layer. addShape(shapeNameString, boundsRect) (Shape) • Create a new graphic of a given shape and place it on the first visible layer. newShape() (Shape) • Create a zero-sized rectangle (presumably to be modified further) and place it on the first visible layer. newLayer() (Layer) • Create a new (top-most) layer. connect(fromGraphic, toGraphic) (Line) • Create a zero-sized rectangle (presumably to be modified further) and place it on the first visible layer. addLine(startPoint, endPoint) (Line) • Create a new line between two points and place it on the first visible layer. newLine() (Line) • Create a new zero-length line (presumably to be modified further) and place it on the first visible layer. duplicate(arrayOfGraphics) (Graphics) • Duplicate existing graphics onto new graphics placed upon this canvas. The original graphics may be from elsewhere - such as from another canvas, a stencil, or another document. graphicWithId(idNumber) (Graphic) • Get the graphic with the given id, if it exists on this canvas. graphicWithName(nameString) (Graphic) • Get the first graphic with the given name, if any. allGraphicsWithUserDataForKey(dataString, keyString) (Graphics) • Get all graphics with the given data string for the user data key. graphicWithUserDataForKey(dataString, keyString)(Graphic) • Get the first graphic with the given data string for the user data key, if any.